S04xE03 – Elena has decided she’s determined to make the best of her senior year at school, and its seems she might just be able to do it until Rebekah shows up. A brief encounter with her in the classroom leads to Elena getting stabbed with a pencil. So as she’s heading to the bathroom to get cleaned up, she sees that Connor the new vampire hunter is roaming the halls. After she’s cleaned herself up the best she can, in walks a classmate with her hand on her neck saying she’s been sent by Rebekah to see if Elena needs any help. Elena then starts to smell the blood, and she hasn’t yet learned self control, and in walks Rebekah threatening to expose Elena to Connor. Rebekah just won’t let up. Elena frustrated with what’s happened is outside with Stefan and Caroline discussing her control. Stefan decides they should just skip the rest of the day and go have some fun. Elena and Caroline are all for it. Meanwhile Matt who has become Elena’s personal food source is cornered by Connor in the hall and forced to give up the name of the vampire friend he has at school So he tell him it’s Rebekah. Next Connor is waiting for Jeremy, to which he informs Jeremy that no one can see the tattoo on Connor’s arm unless you’re a vampire hunter yourself or a future hunter. Connor tries to recruit Jeremy to the cause, and Jeremy plays along. Damon who has managed to track down Connor’s place of residence starts searching through the RV, but doesn’t get far when he gets shot by two arrows that hold him in place because they are tied to explosives. He has to call Dr. Fell to the rescue to remove the arrows. Tyler who is under house arrest after another attack by Connor is visited by an old friend, a cute friend at that, who he used to run with in the same pack. Hayley apparently helped Tyler break the sire bond with Klaus, but never saw Tyler after that. She’d heard that a Tyler was being protected by some of Klaus’ hybrids and stopped by to see if it was him. There’s obviously a connection there, this may prove to be a nuisance of sorts for Caroline’s relationship with Tyler. Rebekah has decided to throw an anti-curfew party at her house. There’s now a curfew in town and no one can stay out past a certain time anymore. So Elena and Stefan decide to crash the party. There Elena runs into April and as they’re talking Rebekah interrupts and plays another cruel trick on Elena by swiping her daylight ring and tossing it into the disposal. Elena is able to recover it, but is ready to kill Rebekah as revenge. Stefan intervenes and reminds Elena that if she were to kill Rebekah that she wouldn’t just be killing her, but thousands of other vampires linked to her. And then tells her that there are other ways to let out the rage, so they leave the party to go for a ride on Stefan’s bike, but first Elena has to show off and rip the attention from Rebekah by doing a keg stand. Stefan and Elena then ride off and there Elena is able to let loose and have some fun. 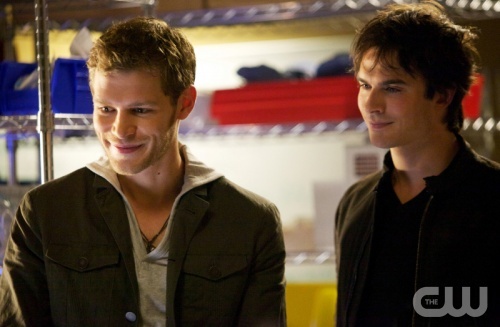 Damon calls the Lockwood house looking for Tyler, but gets Klaus instead. Damon is looking to see if Tyler wants to help kill Connor. Klause volunteers for this instead of Tyler. Jeremy shows up to Connor’s RV and tells him he doesn’t know of any vampires to kill, but does know of a doctor that might. So he lures Connor to the hospital and right into Damon and Klaus’ trap.There Connor gets pinned by his own arrow explosive device. As they’re preparing to dispose of Connor in a ball of fire, Damon happens to mention that Jeremy told him about a disappearing tattoo that Connor has. This intrigues Klaus and as he closes in on Connor, he almost gets a stake in the heart, but Klaus is quick and stops him. Klaus now has the stake in his possession and he sees a symbol is engraved on the stake. Klaus mentions something about Connor being one of the five, and then Connor decides he’s going to take himself out along with Damon and Klaus. Damon manages to get out before the room blows. And you assume that Klaus made it out too. So now Connor is dead. Or is he? Rebekah is at her party when she starts to feel sick and you can see her skin starting to look like it does when they die. So she heads up to her room for a while. April walks in apparently cleaning up the house. April tells Rebekah that she would rather help clean up someone else’s home than be at her own home alone thinking about the family she no longer has. This seems to resonate with Rebekah, and she offers to help April figure out what caused the explosion that killed her dad. Elena with Stefan starts to feel the same way Rebekah has, and they link it to the beer at the party and Connor having laced it with werewolf venom that he extracted from Tyler, so now Elena has the venom in her system, and no idea how to get rid of it. Connor has survived the blast with the help of Klaus, and here we find out that Connor being one of the five is an important thing, and now Connor is going to be protected by Klaus. I hope this gets explained soon, because the curiosity is burning. Best of the episode: Watching Elena let loose and have some fun beginning with the keg stand and then the moving bike stand. She apparently likes to stand on things. Worst of the episode: Finding out that Tyler possibly has another girl waiting in the wings. And that he’s probably already slept with her. Caroline won’t be happy. Where did this episode leave us: Questioning what the big deal is about Connor being one of the five, and why it’s so important that Klaus would save him from the explosion and tell him he’s now protected.